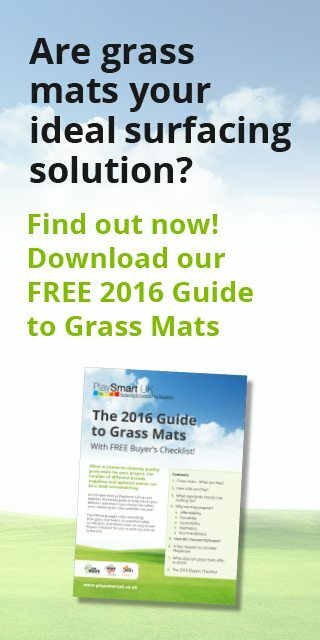 At the end of the 2016 Summer holidays, PlaySmart were approached by Rock Parish Council who had unfortunately been let down at the last moment by another supplier. They were in need of safe playground flooring to replace playground bark. The play area on the village field is very well used but currently surfaced in loose bark which needed regularly topping up and was not even across the varying surface. 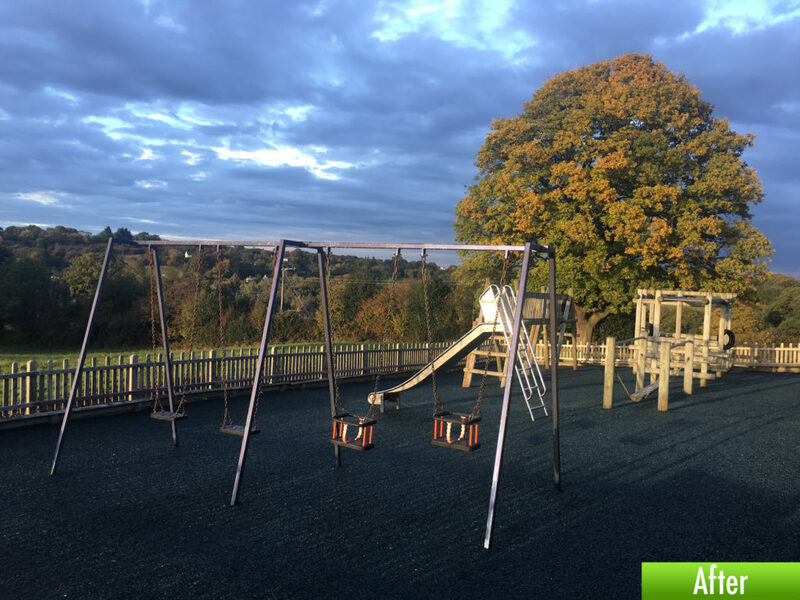 Fortunately PlaySmart were able to assist at short notice to ensure the park was available to use for the local community and suggested the installation of our exclusive bound rubber mulch – JungleMulch, to replace playground bark. 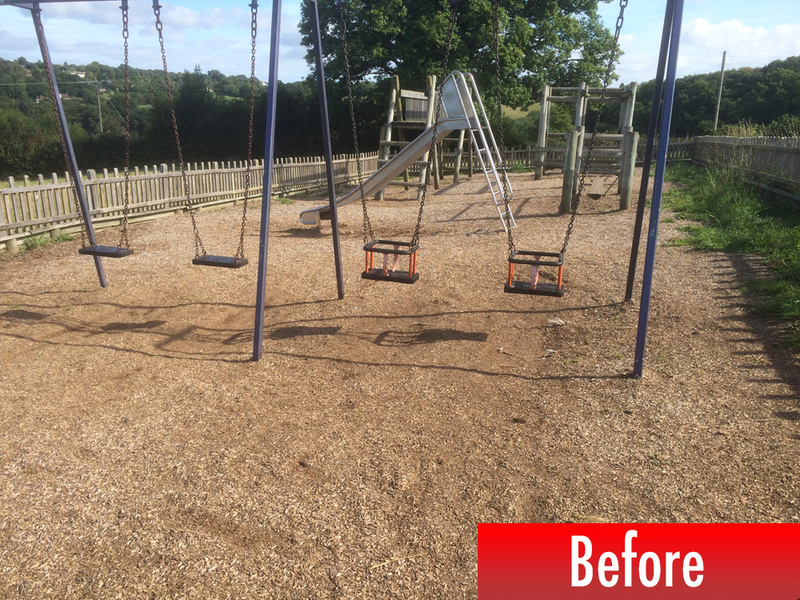 The parish council had recently been awarded funding for their play area development by the Tesco community funding scheme and were able to arrange for a working group of volunteers from the local area to come together to prepare the ground for its new safety surfacing. Works commenced and in a couple of days the surface and play area was ready to be used again. JungleMulch was also the ideal solution to replace playground bark for this slightly sloped areas as it is fully accessible for wheelchairs and buggies and complies to all required British Standards for slip and fall resistance. The bright, vibrant colour will also last far longer than products coloured with a water based pigment. The client commented: “I would personally like to thank you and your company for the fantastic job you have made of putting the new rubber floor in the play area. If you’d like advice on the best surfacing solution for your area, please feel free to get in touch! You can reach our experienced team directly on 01564 742 811 or you can Request a quote.